On An Overgrown Path: Wot no computers? Today the London International Book Fair opens, and for the first time than for more years than I can remember I am not there. I spent the last few years of my time in the corporate world being paid to persuade booksellers and publishers to see the benefits of using computer systems, and to trade electronically using common standards (EDI, XML, metadata and all that kind of stuff - here is a link if you are really interested). This usually meant persuading the small bookseller or publisher to shell out money, and change their established (and effective) business processes. A couple of days ago I was in Malvern for a conference, and followed it with another fascinating monastery hunting trip which took in Belmont Abbey, Dore Abbey (picture above - the Dore Abbey link is worth following, nice web site) and finally a trip up the Honddu Valley in Wales to visit the magnificent Llanthony Priory. 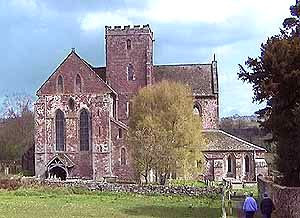 When I get time I'll write a post about these visits; but what extraordinary, beautiful, wild and remote locations were chosen for these monastic communities - I had a job reaching Llanthony with all the benefits of 21st century technology, what must the journey have been like in the 12th century?. After a fairly hairy drive over a single track pass on the flank of the Black Mountains, (and, because I'm a keen cyclist, a decent ride at the summit between banks of snow, on my Moulton APB bike which lives in the boot of my Skoda ), I descended into Hay-on-Wye. For those of you that don't know it Hay is the bookshop town. It has 1,400 population, and 40 bookshops! The bookshops in Hay mean serious business. Just one, the Cinema Bookshop fills the entire disused cinema with more than 200,000 books. For a book addict like me Hay is bliss, and I've tacked a list of books that I bought onto the end of the post. Hay also has a great annual book festival which is well worth investigating. But one thing struck me in Hay. I visited around ten bookshops. And not one single one used any sort of computerised stock control system. So what is probably the best single location for book buying (and knowledge acquisition) in the country functions quite happily with little support rom computers, thanks very much. Makes me realise that none of us, other than Adam and Eve, are indispensable, or as Kipling wrote, with apologies for my parenthesis ............"Words (not computer code) are, of course, the most powerful drug used by mankind." Death in Holy Orders by P.D.James - £3.50 (I wanted a copy to re-read on holiday because of its monastic background, a bit pricey but an almost new copy although the back is badly 'cracked').